We promised it would happen. 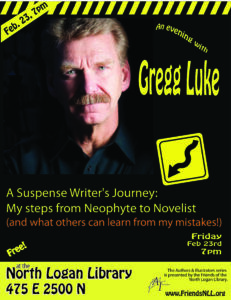 Now don’t miss this chance to talk with one of your favorite local suspense writers, Gregg Luke! 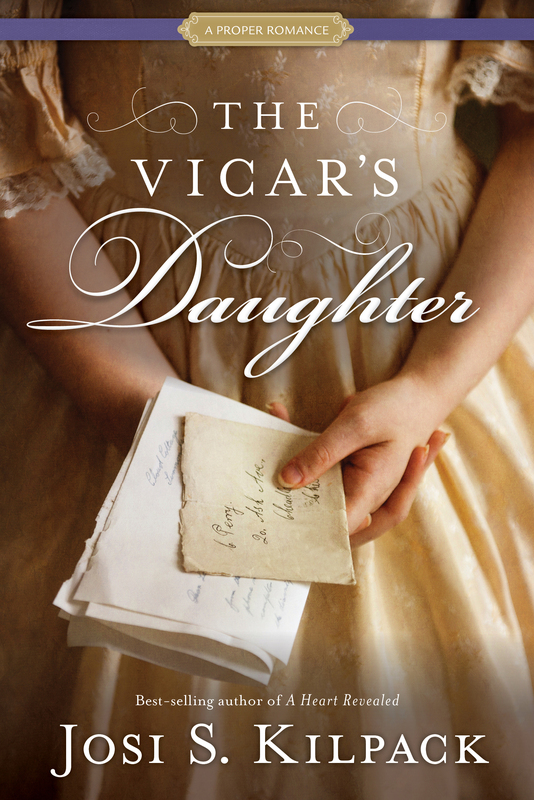 He’ll be talking about his journey as a writer: MY STEPS FROM NEOPHYTE TO NOVELIST. 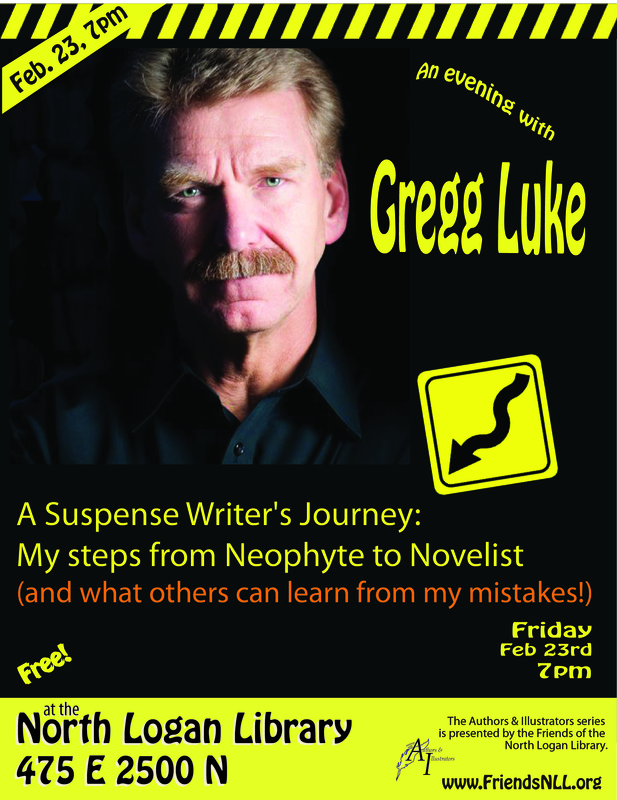 All friends of suspense novels and all aspiring writers are invited to come and meet the master! This will be a fun evening free of charge. Popcorn provided. We hope to see you there! This FRIDAY, February 23, at 7p.m. Have you been waiting for The Traitor’s Game to come out? 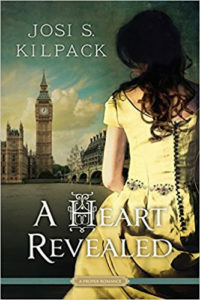 Get a sneak peek! Young adult author Jennifer A. Nielsen is a New York Times best-selling author. She was born and raised in northern Utah, where she still lives with her husband and three children. 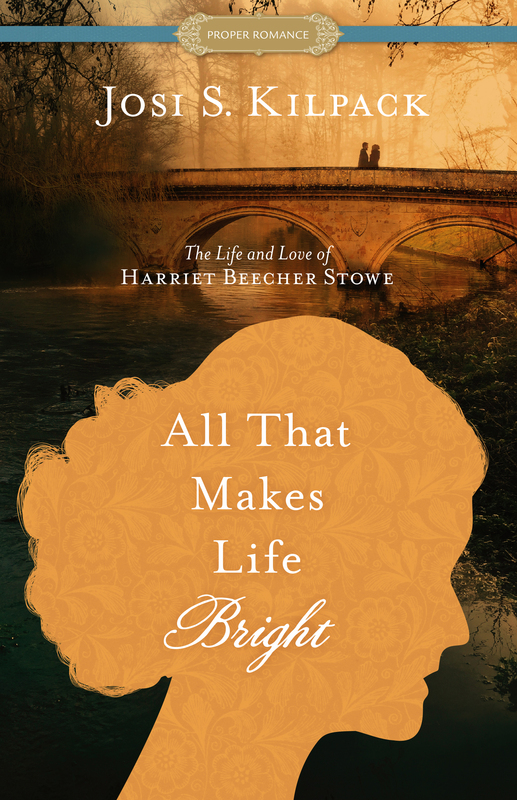 She will talk about the creative process of writing and read from her forthcoming book. The best part: We will be raffling off 6 tickets for breakfast on Saturday, Dec. 2, with Jennifer! 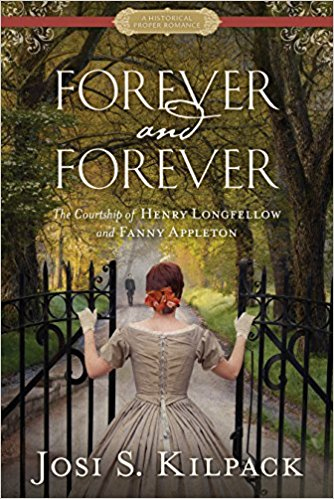 If Jennifer is one of your favorite authors, DO NOT MISS THIS! If you don’t know about Jennifer yet (or even if you’re a fan already), check out her website. There is even an awesome clip of Mark of the Thief. Everybody is invited to come. Bring your friends! This will be a great evening! We hope you can come! 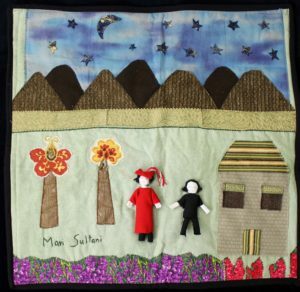 Throughout the month of November, the North Logan Library will be hosting an exhibit by Artisans for Hope and the Idaho Commission on the Arts, titled THIS IS MY HOME NOW: NARRATIVE TEXTILES FROM IDAHO NEWCOMERS. 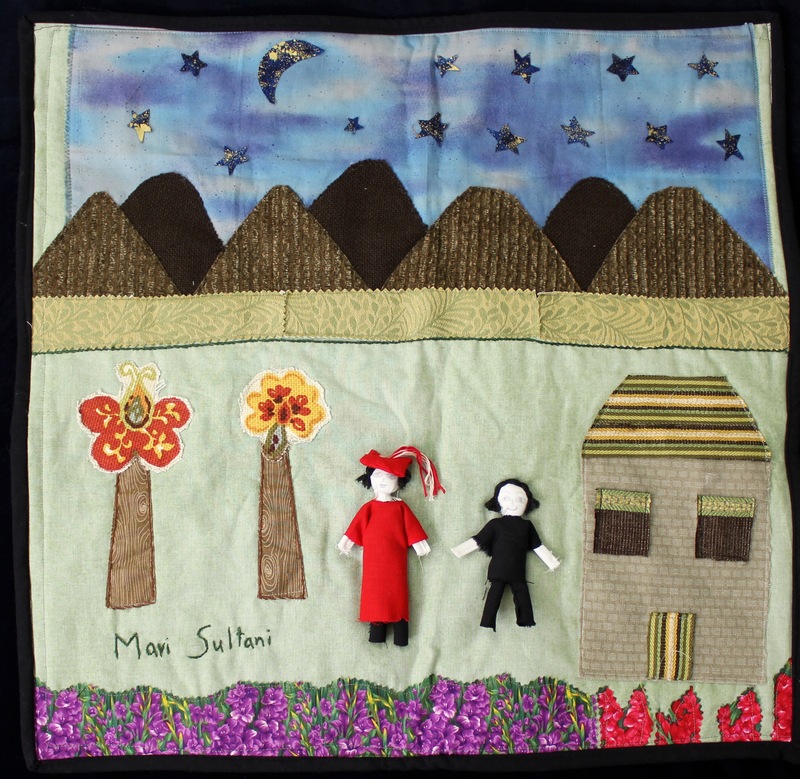 A collection of narratives and accompanying story quilts tells the stories of refugees who made Boise home after living through catastrophic times in their native countries. Unfortunately, most of the actual quilts were destroyed in a fire. However, there are 12 quilts in the exhibit, plus some photographs of the quilts. They are all accompanied by the artisans’ history, detailing why and how they came to Idaho as refugees. Volunteers from Artisans For Hope worked with the refugees on how to express the essence of their stories in small story cloths. Their stories are horrific, their art beautiful. The exhibit is distributed throughout the library. Friday, November 10, 10 a.m. at MY GIRLFRIEND’S QUILT SHOPPE (1115 N 200 E, Logan). This event will focus on how to tell your story by making story cloths. Friday, November 10, 7 p.m. at Cache Refugee and Immigrant Connection (CRIC) (429 N Main, Logan). This event will focus on the refugees’ lives, their stories, how they ended up in Idaho, how the support from Artisans for Hope helped overcome trauma and facilitate communication between different cultures. is excited to announce that after several years of planning, the city is considering building a new state-of-the-art Community Center that will host the new North Logan Library and a Children’s Discovery Center (Children’s Museum) in the heart of the City Center (near 2150 N 300 E). This Community Center will primarily be paid for with the existing Library resources and generous citizen donations. The Community Center will be located adjacent to a relatively large park space. This area will be the center for daily, weekly, monthly, and annual major events and programming that will tie the community together. With this announcement, we would like to involve the citizens of the community in the planning process. In order to help steer the City in the right direction, we would like to encourage you to fill out the following survey. Your input will help determine the types of programs and features that will be located in the Library/Children’s Discovery Center. Josi began writing her first novel in 1998 and has written twenty-five novels, one cookbook, and been part of multiple collaborations since then. 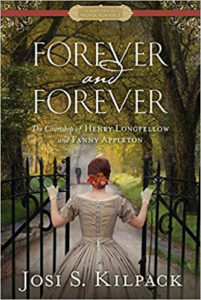 She is a four-time Whitney Award winner and Best of State winner in Fiction. 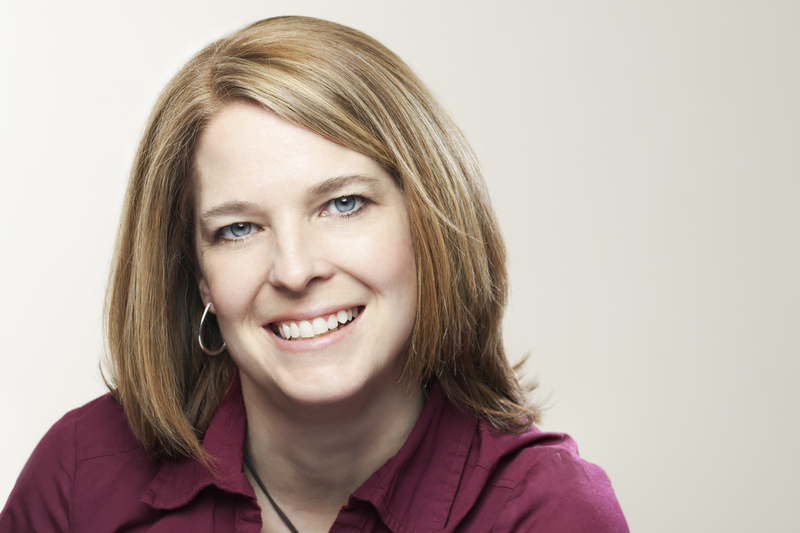 Josi currently lives in Willard, Utah, with her husband and children. Josi excels in various genres: historical romance, regency romance, mysteries, novellas, anthologies, women’s fiction. Please join us for an evening with the amazing Josi Kilpack. 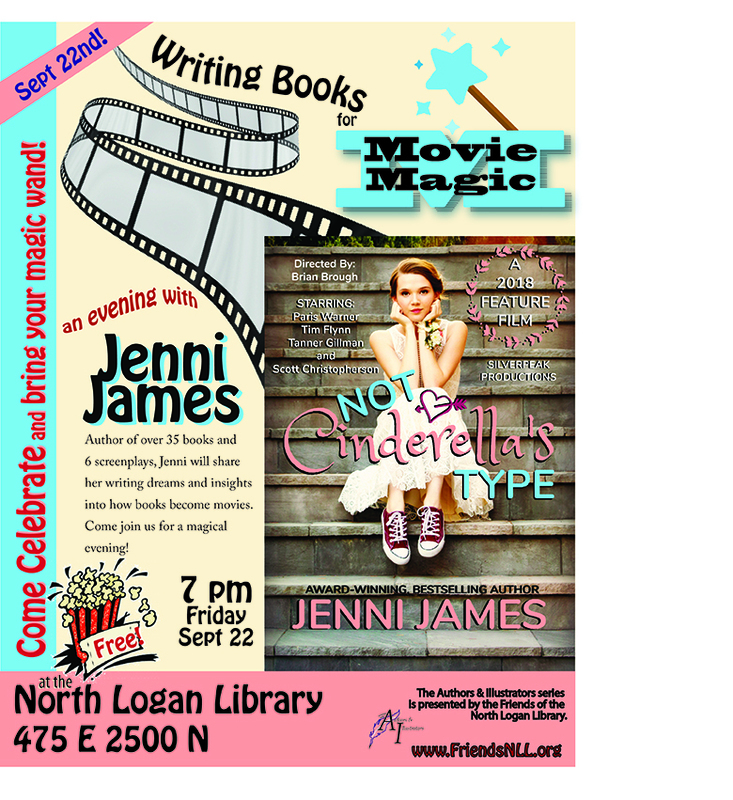 Jenni James, a favorite among Young Adult readers, is coming to the North Logan Library on September 22, 2017. Please join us in a wonderful evening. Jenni will share her insights into how books become movies. This event is FREE to the public. 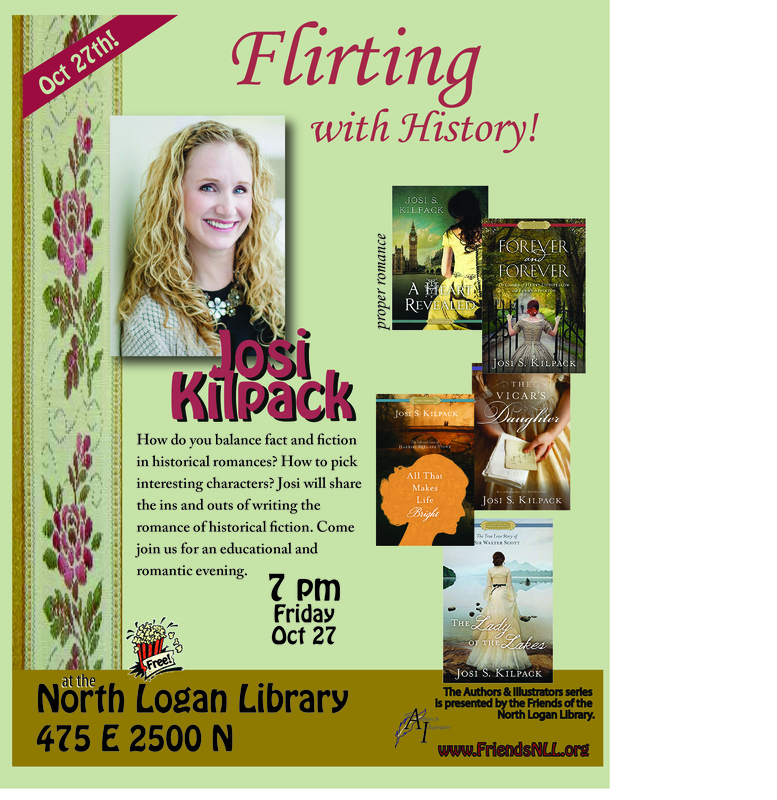 You don’t have to be a North Logan Library patron to attend! As always, free popcorn and a raffle! 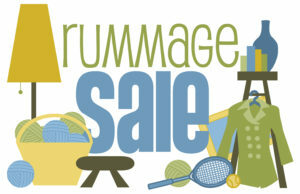 Do you have some things you want to get rid of, but you don’t have enough stuff for your own yard sale? Bring it to the COMMUNITY YARD SALE by the Library on. Setup starts at 8:00. Be ready to sell at 9:00. This yard sale is going on in conjunction with the 25th Street (Farmers) Market. Love to shop yard sales? This one will be big! Come and check it out! Save the date! We will post details as they become available. Stay tuned! 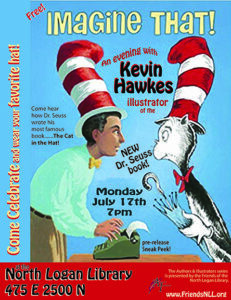 As part of our Authors & Illustrators event, the Friends of the North Logan Library are hosting Kevin Hawkes, illustrator of IMAGINE THAT!—Random House’s new book, to be released this September—explaining many fascinating details about Dr. Seuss. Local Seuss fans will get a sneak peek at the book and discover behind-the-scenes insights. Hawkes, and author Judy Sierra, were selected by Random House and the Geisel family to create a kid-friendly exploration of the early career of Dr. Seuss (a.k.a. Ted Geisel). They captured the familiar bouncy rhythm and colorful art associated with the Seuss books to reveal little-known facts about Dr. Seuss and his creative talents. Hawkes, whose parents reside in North Logan, Utah, will talk about his illustrating experience and share interesting tidbits from the book, as well as demonstrate how he navigates the process of creating his characters. As a bonus, Hawkes will also share another of his illustrated books coming out in August, Dogosaurus Rex. This evening will be a hit with all ages. And it is FREE! Everyone is encouraged to wear their favorite hat, enjoy the coloring table and come and celebrate at the Library on July 17 at 7 p.m.